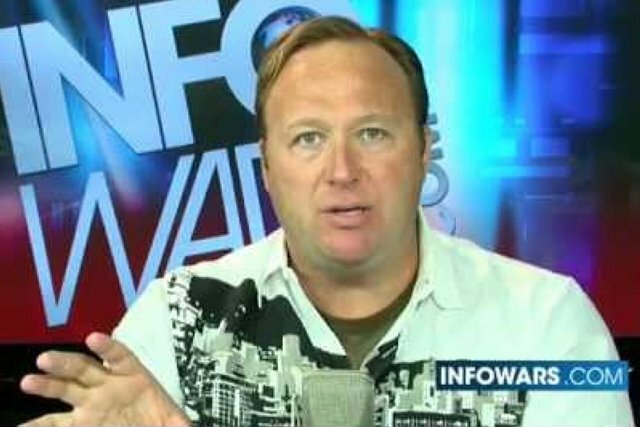 Ever since the fringe conspiracy theorist Alex Jones appeared on Piers Morgan’s show this week, the conservative punditry, pro-gun groups, and other right wing figures have been doing everything they can to distance themselves from his special brand of lunacy. But when you compare the paranoid gun rhetoric of Jones with that of the recoiling mainstream voices, the message is remarkably similar. From both sides, you’ll hear references to Stalin and Hitler, and a creeping government initiative to confiscate guns from law abiding citizens — all classic rantings from the self-published Black Helicopters Over America-type books that surfaced in the early 90s. Piers Morgan’s cynical yet brilliant move of luring Alex Jones into a debate on his show (who, as it turns out, was behind the “Deport Piers Morgan” petition), was an obvious plot to smear the gun lobby with the voice of a lunatic. But in an ensuing debate with Breitbart.com’s Ben Shapiro (see videos below), Morgan, although up against a much more formidable opponent in Shapiro, got his guest to reiterate the Jones ideology that calls for the stockpiling of assault weapons within the common populace just in case of a future tyrannical shift in government. In the weeks following the tragic Sandy Hook killings, there’s been a vague fog obscuring the rationale behind the NRA’s base and their unwavering position on assault weapons. But now as the fog clears, it’s more apparent that this stance is based on a paranoid delusion that even mainstream conservative media sources are now voicing more openly. With the GOP emerging from the wreckage of Todd Akin and the 2012 Campaign failure, it seems that they’re once again finding themselves being led by extremists down the road to oblivion. What an intelligent and well thought out point Vera. OK, just for the sake or YOUR argument, let’s just SAY that you get to keep your AR-15’s you EVEN get to upgrade them to full automatic AND the U.S Government DOES TYRANNICAL on us. Jut WHAT exactly do you think your fully automatic pea-shooter is going to do against the full might and sheer power of the U.S. Armed forces, WHO, by the way, receive the BEST training money can buy to go along with all of their “big boy toys”. What do you think your pea-shooters are going to do against the extensively trained and fully armed police forces within America? While there MAY be a LOT of Barney fife’s in Podunkville, USA, our inner city police forces obtain the equivalent training to our military and have free access to comparable weaponry as well. You are living in a FANTASY World if you think your tiny spit wad throwers are going to stop any of these forces from achieving their objectives. Whatever drugs that you are under the influence of must be REALLY good to let you actually believe such fantasies! I personally arrived right here from a different page on the subject of zapya app download and thought I might as well look into this. I really like what I see so I am just following you. Looking towards checking out the site again. Howdy could you let me know which blog platform you are dealing with? I’m looking to get started with my website on garageband windows download very soon yet I am having a tough time making a decision. certainly like your website however you need to take a look at the spelling on several of your posts. Several of them are rife with spelling issues and I to find it very bothersome to inform the truth on the other hand I’ll surely come again again. Appreciating the hard work you put into the website and in depth information you present. It really is good to come across a blog once in a while that is not the similar old re-written material. Fantastic read! I have saved your website and I’m including your RSS feeds to my facetime free web page. Hi there could you inform me which blogging platform you are making use of? I am looking to start my own personal site on lucky patcher apk in the near future yet I’m having difficulties making the decision. I just want to say I’m beginner to blogging and site-building and definitely enjoyed your web page. Most likely I’m going to bookmark your site . You surely come with really good well written articles. Appreciate it for sharing your web site. I love this! I kind of remember those commercials but I was too young to really “get” the story. Pre-Giles is delicious, though. And yes, you HAVE to recap that book. Pleeeeaaaase!